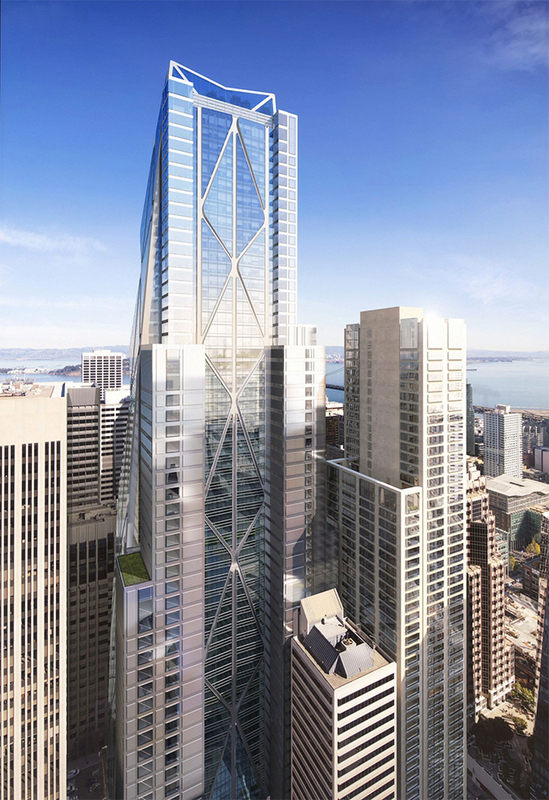 Thursday marked the ceremonial groundbreaking for Oceanwide Center, a complex of two towers and some smaller buildings, the tallest being 910 feet tall, at First and Mission Streets. Designed by London-based Foster + Partners and local firm Heller Manus Architects, the tallest of the towers will be the second highest structure when it's completed, with an expected opening timeframe of 2021, as the Business Times reports. It's a development by Oceanwide Holdings, a Beijing-based investment firm that does real estate development as well as dabbling in finance and energy. An Oceanwide spokesperson tells the Business Times, "We tend to focus on central urban areas, downtown areas. We like large-scale mixed-use projects." 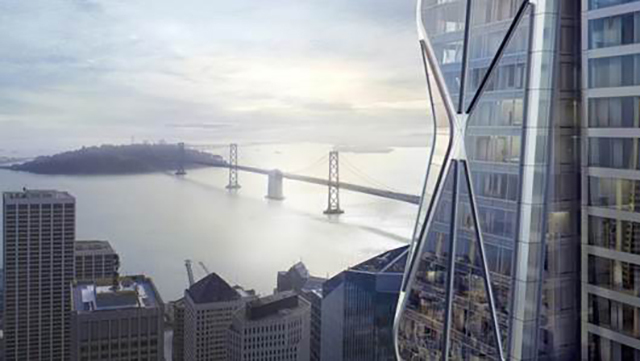 We first saw a rendering of the Norman Foster-designed main tower over two years ago, and the criss-cross pattern of structural beams on the tower's exterior appears to have evolved somewhat since then. The project is planned to include 34 floors of office space in the 61-story main tower, as well as 109 luxury condos on the top 20 floors. The shorter, 54-story tower on Mission Street will include 156 condo units, along with a Waldorf Astoria hotel, a restaurant, bar, and spa. In total the development encompasses 2.4 million square feet of space, of which 26,000 square feet will be pedestrian plazas and connections at the ground level. Also included will be the adaptive reuse of two historic buildings at 78 and 88 First Street, which will contain office and retail uses. 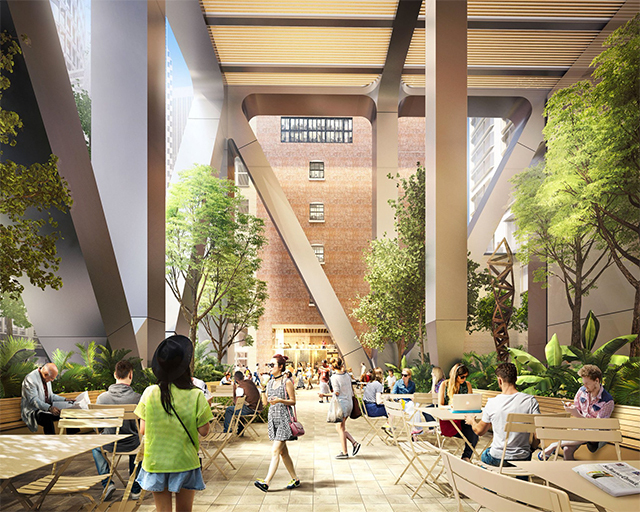 The rendering above also appears to show an indoor garden atrium on the top story of the main tower. Says Chen Wu, CEO of Oceanwide Center, "We are most appreciative of everyone’s support and cooperation, and we look forward to giving the city a project that will be a source of pride for all San Franciscans." The project is being financed internally and does not yet have a publicized budget. * This post has been corrected to note that statements by the mayor regarding $140 million of housing being built appear to be incorrect, and no affordable units will be built onsite. Follow SFist on Twitter and Instagram, and like us on Facebook. You can also get the top stories mailed to you—sign up here Why your Muni fare might be more next month.